Queenstown is known as the adventure capital of New Zealand. The city is packed with tourists, particularly young back packers. 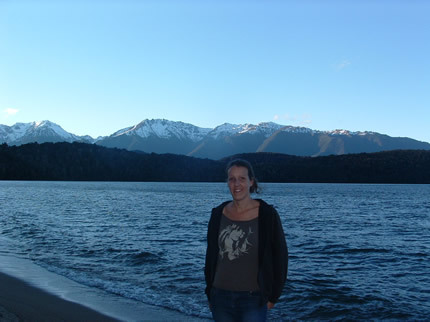 The city is set in beautiful surroundings, with mountains all around and the beautiful lake Wakitipu. Queenstown is packed with café’s, bars, restaurants, shops and hotel’s. We took a walk around the city this morning. We went to the Queenstown Gardens, which is based in the city. We saw people playing a game called Frisbee Golf. It is very similar to golf, except the Frisbee is the ball. This has been played in Queenstown since the 1980’s. You will all be disappointed or glad to hear that we didn’t do a bungee jump, like a lot of people do when they come to Queenstown. We were thinking about it, but when we went to find out the price, we decided we didn’t want to pay it ( $180 each £70). I’m not sure if I’d actually be able to bring myself to jump anyway. We drove to a near by town, called Arrowtown, in the afternoon. Arrowtown is famous for it’s gold. In the 1980’s it attracted a massive amount of gold miners. Tourists still come to Arrowtown today to see if they can spot any gold along the river bank. We did a 40 minute walk along the riverbank and tried to see if we could spot any gold, but no gold for us! Arrowtown is a lovely town to visit. It has kept it’s history alive by keeping a lot of their old buildings. You feel like you have gone back in time. The rain came pouring down in the early evening. We drove back to Queenstown and decided we would go to the cinema to watch ‘Dinner for Smucks’ starring Steve Carell in. It was extremely funny. The rain didn’t stop. We slept in our camper in Queenstown tonight. NOTE: Shower facilities in Queenstown found at the Event Centre swimming pool and Frankston Motor Camp. 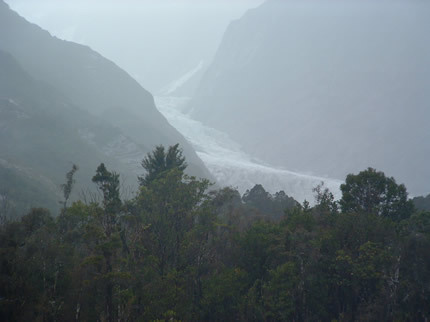 Today we drove on towards, Franz Joseph Glacier. If we wanted to put money into doing adventure activities, we would of stayed a few more days in Queenstown, but when you have been travelling for 8 months, you have to think about watching your money. 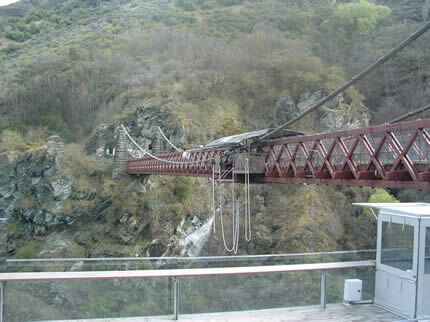 Kawarau Bridge-The famous bridge that you can do a bungee jump off. When I went to stand on the bridge, I decided that I don’t think I’d be able to bring myself to actually jump. Cromwell- We only stopped in Cromwell. We took a quick walk around looking at the shops in the town. 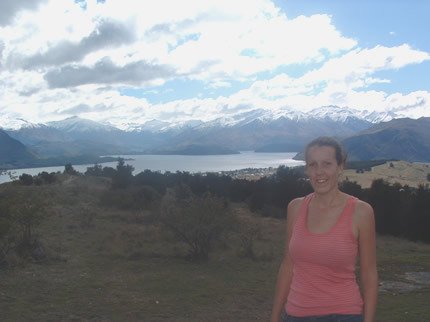 Wanaka- Wanaka is another beautiful town surrounded by mountains. 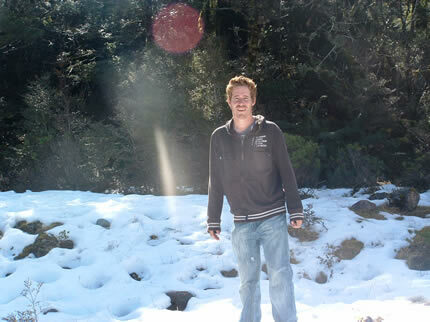 We took a walk around the town and by the lake, then we drove 2km out of the town, to Mt Iron. We decided to do the 1 ½ climb up Mt Iron. It was fairly steep, but an easy climb for most. The view from the top is worth the climb. You get to see the shape of the lake and how it winds in and out. Also you get a great view of the mountains all around the lake. The name Mt Iron, simply comes from the fact that the shape of the Mount, looks like an Iron. Blue Pools Bridge- We had to walk across two suspension bridges to get to the blue pools. The water is extremely pure because it is 100% melted ice water. Rock Slides just after Fantail Falls- I’m not sure what this area was called. There were loads of rock slides blocking the river, which created a roaring river. Haast Beach- Hasst was a small town. We just stopped briefly at the beach. 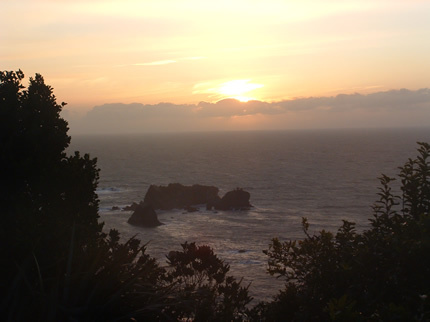 Knights Point- A fantastic lookout, where we managed to catch the sun setting over the sea. The drive to Franz Joseph was one of the best drives yet. There is so much to see, that we were stopping every 5 minutes. We arrived in Franc Joseph at about 10pm. It was just a small town, yet highly visited because of its Glacier. We went to sleep in our camper as soon as possible. We woke up this morning to extremely heavy rain, which is not unusual for Franz Joseph. 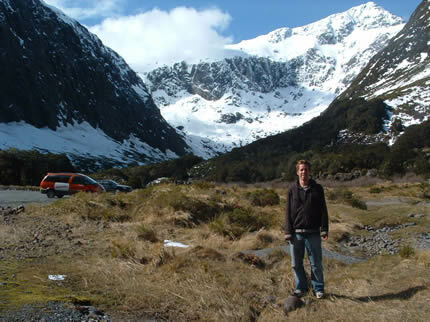 Franz Joseph receives about 300,000 annual visitors, making it the busiest tourist stop on the west coast, supported completely by a Glacier. Most people take a guided tour of the Glacier. This is the safest way to view the Glacier and it is advised that you only walk it on your own if you are experienced. We decided to just take a walk to view the Glacier, as it was extremely wet, also we were running short on time, as we only had 4 more days left on our car hire. We drove to near the Glacier, where we did a 30 minute walk to the view point of the Glacier. We were able to get a good view of it from here. There were several other walks to do, but we were already completely wet through. The Glacier is now retreating. It is melting faster than it is moving. We drove on to Nelson this afternoon. 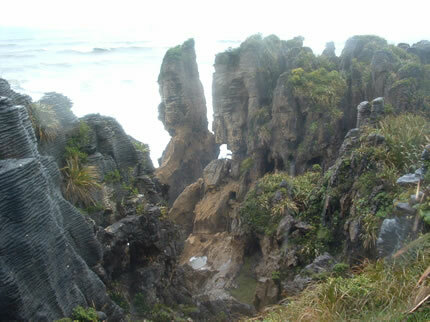 We drove through Hokitika, Greymouth and we stopped in Punakaiki, to see the famous ‘Pancake Rocks’ and Blow Holes. It was still pouring down with rain when we arrived in Punakaiki, but we still decided to get out and go and see the Pancake Rocks. There is an information center there, which is a great place to go first to learn a bit about the history of the formations. They were formed over 30 million years ago from fragments of skeletons and shells. These limestone rocks have been sculpted over the millennia by weak acidic rain, wind and sea water. 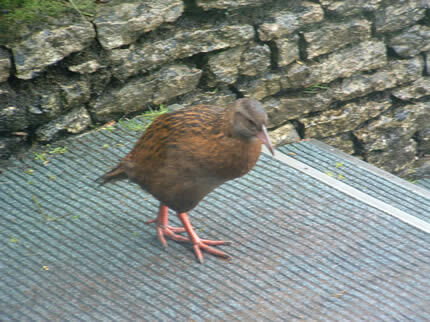 We saw a Weka bird just before we left the Pancake Rocks. 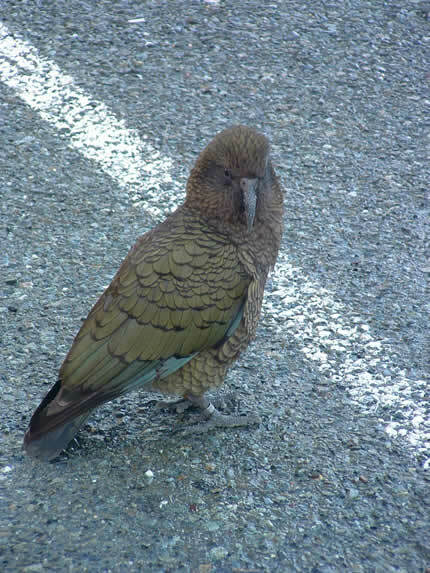 This is a native bird to New Zealand, found mostly on the West Coast. They look similar to the Kiwi and can’t fly. We continued our drive on to Nelson. We didn’t stop on the way, except a brief stop in Westport, as the rain was still really heavy. We arrived in Nelson at about 8pm. Nelson is just about the most central place in New Zealand. 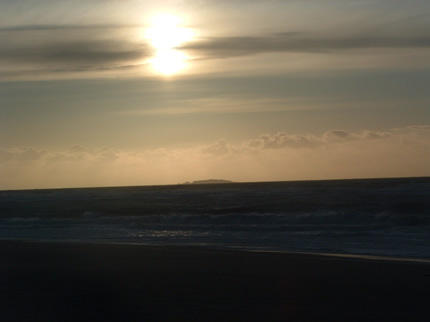 It is o the shore of the Tasman Bay. 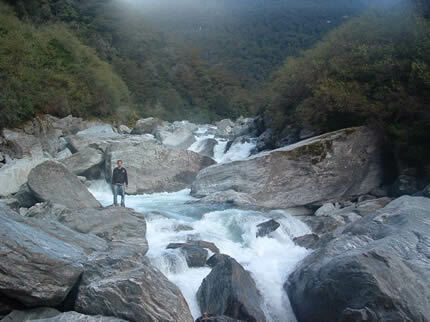 It is a great location to place yourself, when discovering the North of the South Island. Today we drove along the coast from Nelson-Cape Farewell Spit. 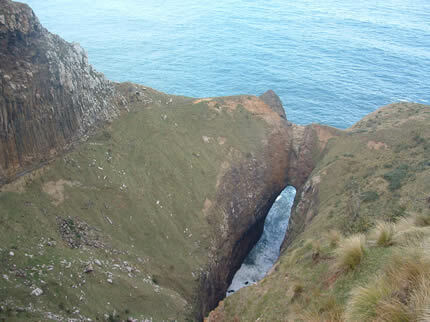 This is found in the northern tip of the South Island. We drove through the town of Motueka and also through part of the Tasman National Park. When we got to the Farewell Spit, we walked along part of it. 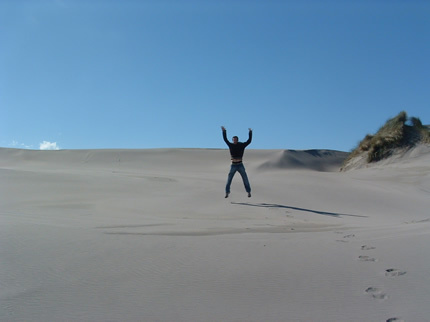 There are high sand dunes all along the spit. We took a walk up onto the sand dunes. After spending about 1 hour walking around the spit we drove back towards Nelson. 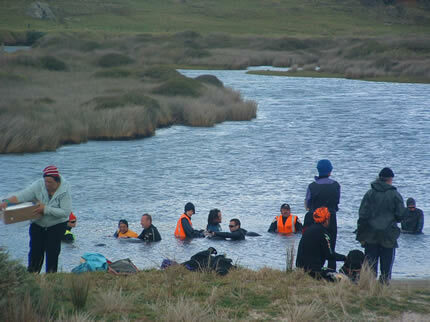 We stopped at Waikoropupu Springs on the way. 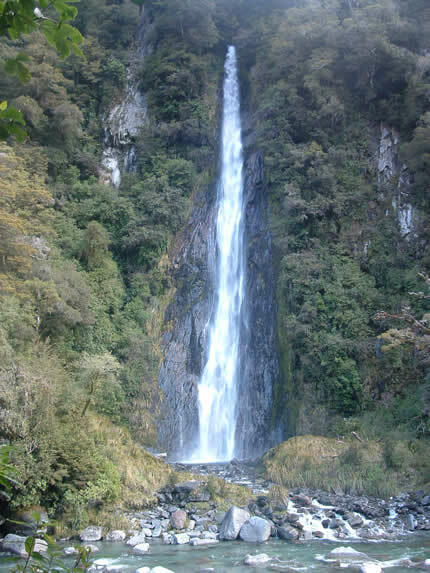 This is the largest spring system in NZ, and one of the 100 top largest in the world. 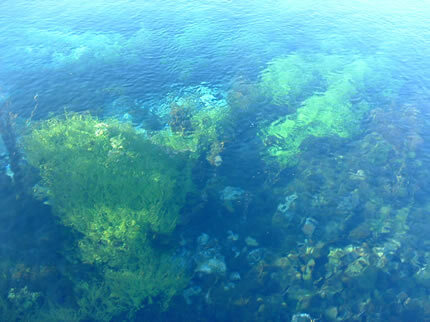 The water was so clear that you could see everything beneath it. We stayed in Nelson again tonight. Today we drove to Picton, which is another 1 hours drive from Nelson. 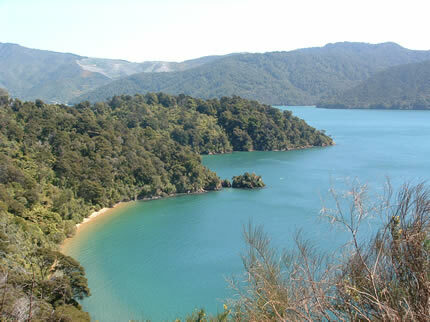 Picton is in a fantastic location, near the Queen Charlotte Sound. A sound is a river valley flooded by the ocean. We stopped at Cullen Point lookout in Havelock. This is one of the best places to view the sounds. We did several walks in Picton. We did a 1 hour walk to Bobs bay and also a 1 hour walk to the harbour view lookout. The views from here reminded us of being on Phi Phi island, with such beautiful greenery and blue water. 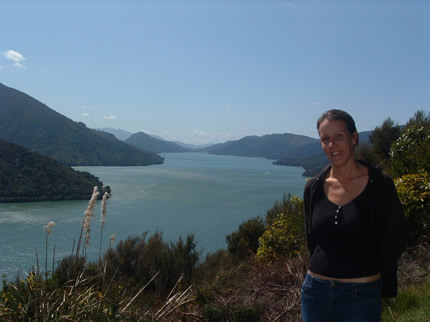 We really liked Picton and its lay backed feel and gorgeous scenery. We drove on to Blenheim, which is a much more built up city about 30 minutes south of Picton. Then we drove on to Kaikoura, which is a great place to stay if travelling to Hamner Springs. It is just a small town by the sea. 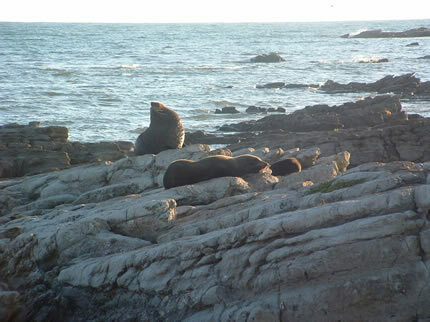 This morning we took a look around Kaikoura and drove to a beautiful bay near the town, where we were able to see seals on the rocks. 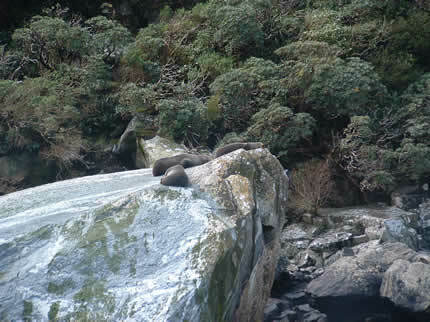 They are known as the New Zealand Fur Seal. We drove on to Hamner Springs today. Unfortunately I’m in a rush to get this blog up, so i will have to fill you in on the rest later. We took our camper van back today. First of all we checked into the So Hotel in Christchurch, to get rid of our bags. There were no problems with the camper, it just took two minutes to get it looked over, then we walked back to our hotel. We have really enjoyed travelling around the South Island. At first we didn’t know weather we would get to see the South Island as well, but we’re so glad that we did. The South Island is just stunning and it would have been such a shame to miss it out. It was great to be back in a hotel. We didn’t realise how tired we were. The hotel was fantastic. It has everything you need. The room was small, but cosy. There was free Wifi, a gym, free Mac’s to use downstairs, restaurant and laundry facilities. We stayed in Christchurch from 14th-18th October. We are now back in Auckland and we fly to Quito tomorrow (Thursday 21st October) afternoon. We can’t believe how fast time is going. We have just 6-7 weeks left now until we return to the UK. After showering we drove to th Bluff-which is the town in the most southern point of New Zealand. We drove up to the lookout there, where you can get a great view of the land. We then drove back to Invercargill to visit the Museum and Art Gallery (found by the tourist information). 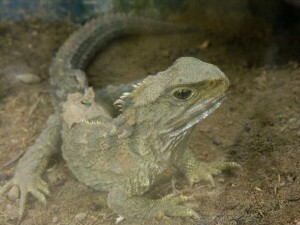 We were able to see the Tuatara-which are only found in New Zealand. We also went to Queen’s park, which is a fairly large park with an Aviary in it. We set off towards Te-Anua at about 11am. This is 168 Km away, on the scenic route, which we took. The drive was extremley scenic, as is most drives in New Zealand. We stopped off at Calac Bay, Mullet Bay and Monkey Island. It is called Monkey Island, because of a Monkey Winch they used to pull the boats up on to shore. 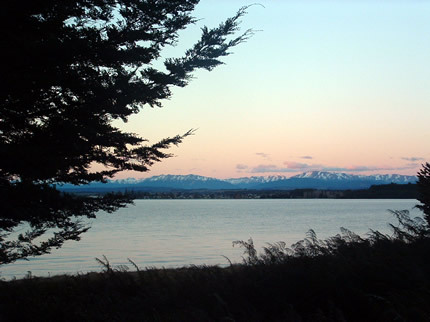 We walked over to the small island, where we were able to see a beautiful view of the snowy mountains across from us. We also stopped at McCrakens Rest lookout. This is another great spot for viewing the mountains. 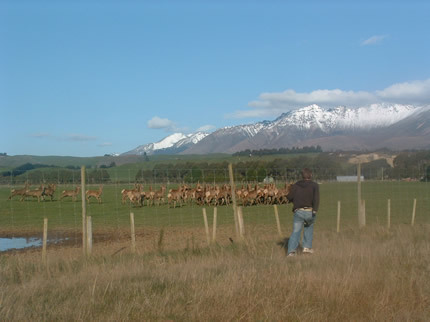 We continued our drive on to Te-Anua and on the way we came across a few fields with deer in. We walked over to look at them and they just stood and stared at us. They were extremely inquisitive trying to figure us out. As we walked closer they walked further. As we walked further away, they started to look back towards us to see if it was safe. They were so silent when they were watching us, and they all stood closely together. We continued driving to Te-Anua. 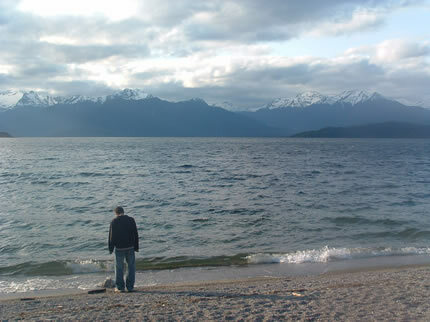 We got to Lake Manapouri at about 7pm. 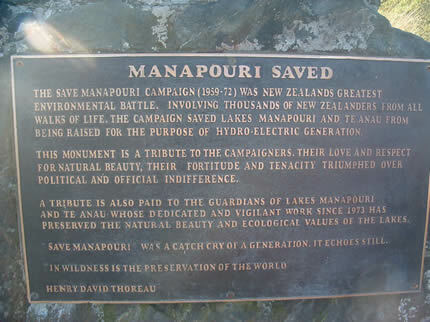 They were going to flood Lake Manapouri for the use of Hydro-electric power. Luckily for everyone, locals and tourists, this didn’t go ahead because of campaigners. It would of been such a shame to destroy this beautiful area. We got to Te-Anua at about 8pm. It was just a small town, but it had everything you needed, restaurants, shops, tourist info, supermarket, internet, laundry and beautiful surroundings. 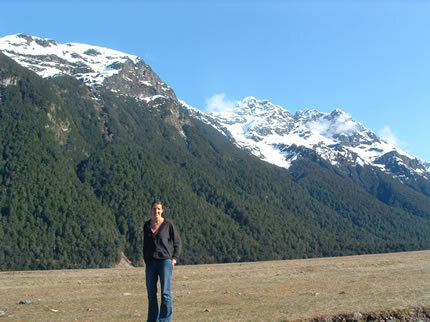 Te-Anua is the best place to stay when exploring Milford Sound and Fiordland National Park. 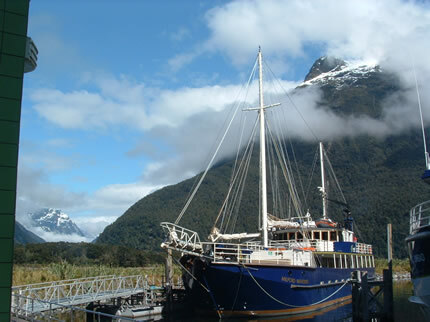 We went to the tourist information briefly to find out about cruises of the Fiords and Milford Sound. We decided to wait till the morning to book our cruise, as we wanted to see what the weather was like. One of the advantages of sleeping in a camper van is that you get to pick what view you want from your window. Tonight we slept with the view of snowy mountains from our window. We woke up this morning in our camper, to a beautiful sunrise over the mountains in Te-Anua. After getting ready we went to the tourist information to book our tickets for the cruise at Milford Sound. 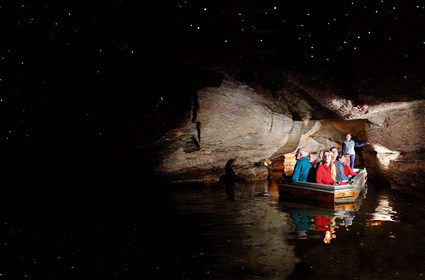 We decided we also wanted to go to the Glow Worm caves, so we booked a double package for a cruise of the fiords at Milford Sound and a cruise to see the Glow Worm Caves on the Te-Anua Lake. 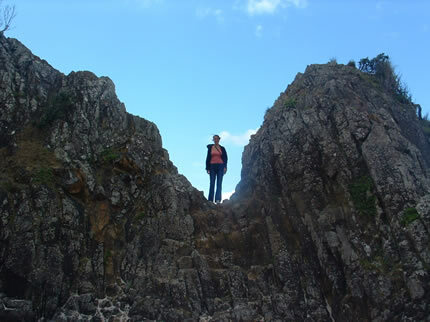 We were unsure of which one to do today, but decided we would go with the caves, as it looked a little cloudy outside. 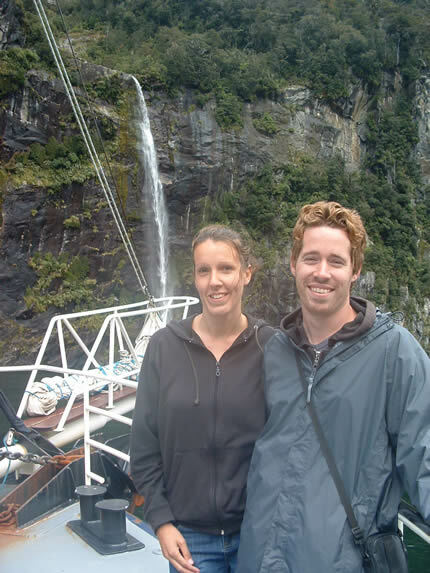 We are so glad we decided to do this, as later we found out from someone who did the cruise at Milford Sound, that it was so wet and cloudy that they couldn’t even see the fiords! The package to see the Glow Worm caves and go on a 2 1/2 hour cruise of the Fiords at Milford Sound cost $14o each (£70). You save about $15 by booking both together. The trip to see the caves wasn’t until 2pm. We met at the Real Journeys office, found next to the tourist information in Te-Anua at about 1.40pm. We were told to wear worm clothes and good shoes, because it can be a little cold and slippery in the caves. 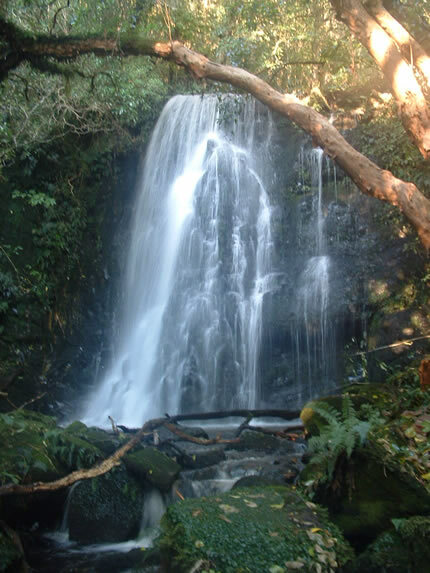 The ancient maori name ‘Te Ana-au’ means the ‘cave with a current of swirling water’. 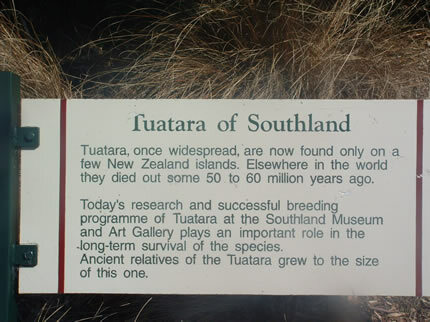 It was this translation that led to the discovery of the Te-Anua Glowworm caves in 1948. First of all we went on to a cruise boat, taking us over to the entrance of the caves. The journey over is also part of the whole package, as we were able to see the amazing views over the lake, of snowy mountains. When we arrived at the caves we were led into a visitor centre, where we watched a short video showing the cycle of the glowworms life and a member of staff also gave us a brief history of the caves. Eggs (20-24 days)-Each adult lays approximatley 130 tiny eggs. They hatch about three weeks later. Hatching occurs in all seasons but is most common in December. Larva (9 Months)-As soon as it hatches, the glowing larva builds a nest and begins catching food. When it reaches 30-40mm, it covers itself in a protective skin and becomes PUPA. Pupa (12-13 days)-Suspended on a long thread, the larva begins turning into an adult fly. Both males and females glow but the female becomes much brighter before she hatches, attracting adult males. Adult Fly (1-5 days)-When it becomes an adult it’s only purpose is to breed die. The female usually dies immediately after laying eggs. The male lives up to 5 days after. When we finally entered the caves, we were led by a guide. We were split up into smaller groups and left 5-10 minute intervals in between. The entrace to the caves is very low, and we needed to bend right down to get in. There is a hand rail that you can hold on to guide you through the caves. The caves are 6.7km deep. The 12,000 year old caves are carved from limestone rock which is over 35 million years old. Unfortunately we have no pictures, as you are not allowed to take photos in the caves. This diminishes the effect of the glow worms. After walking through the caves for about 20 minutes, we arrived at a small boat, that our guide led all 13 of us on to. The guide switches off her torch at this point, and tells us all to stay in complete silence. She pulled the boat along with a rope that was above her head. At this point we were able to see glowworms everywhere. This is such an amazing site, like stars in the sky. The atmosphere is amazing, as there is not a sound or any artificial light, just the beautiful glow of the worms. I would definatley recommend a trip to the caves if you get a chance. It was a unique experience. We arrived back in Te-Anua at about 4pm. It was a really nice evening, so we decided to go for a walk around Lake Te-Anua. We did a 1 1/2 hour walk. We drove around to the start of the walk, which is just a 5 minute drive from Te-Anua. 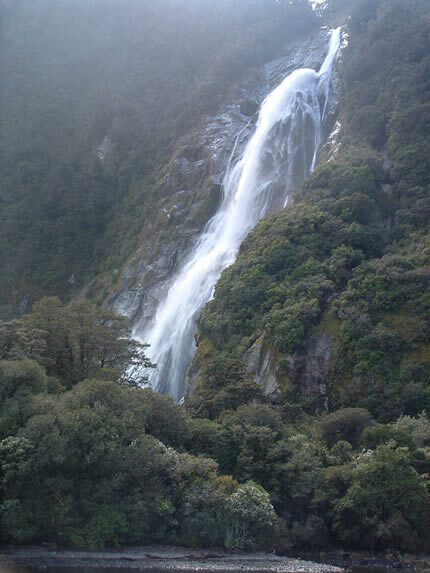 The walk takes you through the Fiordland National park. It is a 60km track, but we just did a little part of it. Today was a day we were both really looking forward to, as we were going to Milford Sound to take a cruise to see the Fiords. This is the number one tourist destination in New Zealand. Milford Sound (Piopiotahi in Māori) is a fjord in the south west ofNew Zealand’s South Island, within Fiordland National Park and theTe Wahipounamu World Heritage site. It has been judged the world’s top travel destination in an international survey (the 2008 Travelers’ Choice Destinations Awards by TripAdvisor)  and is acclaimed as New Zealand’s most famous tourist destination.Rudyard Kipling had previously called it the eighth Wonder of the World. We set off from Te-Anua at about 9.30 am to give us plenty time to get there, ready for our cruise at 12.30pm. They say to give yourself about 2 1/2 hours to get there, as the roads get quite windy when you get closer to Milford. Also in the winter you have to watch out for snow on the roads. We also made sure we topped up the car with petrol in Te-Anua, as there are no petrol stations on the way, or at Milford (apart from emergency petrol at Milford, which costs a fortune). The journey to Milford is so scenic. We stopped a long the way at several places. Here’s some pictures of our journey towards Milford Sound. This lake was so still, that you could see a perfect reflection on the mountains. We saw this rare Parrot, known as the Kea, on our way to Milford. They are very mischievious birds, and like to pull at things. The Kea (Nestor notabilis) is a large species of parrot (family Strigopidae) found in forested and alpine regions of the South Island of New Zealand. Measuring around 48 cm (19 in) in length, it is mostly olive-green and has a large narrow curved grey-brown upper beak. The Kea is one of the few alpine parrots in the world. Its omnivorous diet includes carrion but consists mainly of roots, leaves, berries, nectar, and insects. Now uncommon, the Kea was once killed for bounty as it preyed on livestock, especially sheep. It only received full protection in 1986. There were so many places to stop at along the way, but we had to make sure we got there on time, so we had to leave many places out. We arrived at Milford Sound at about 12 pm. giving us plenty time before our cruise at 12.30pm. The weather was amazing, hardly a cloud in site, we were so lucky, as Milford get’s a heavy down poor of rain and rains an average of 182 days a year. We got on to our cruise at about 12.15pm. We decided to sit up stairs, in the open, to get the best view possible. Milford Sound runs 15 kilometres inland from the Tasman Sea and is surrounded by sheer rock faces that rise 1,200 metres (3,900 ft) or more on either side. Milford Sound was initially overlooked by European explorers, because its narrow entry did not appear to lead into such large interior bays. 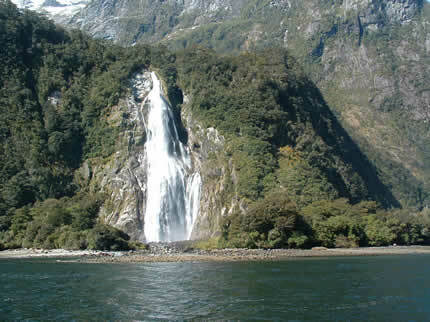 Sailing ship captains such as James Cook, who bypassed Milford Sound on his journeys for just this reason, also feared venturing too close to the steep mountainsides, afraid that wind conditions would prevent escape. 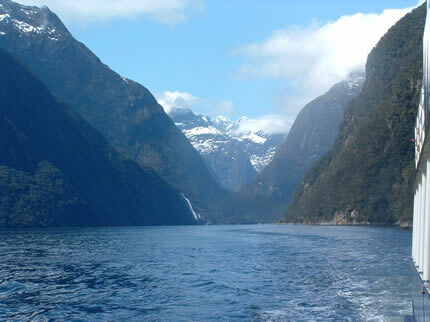 Today between 550, 000 and 1 million visitors come to see the Fiords at Milford Sound, each year. The cruise trip was fantastic. 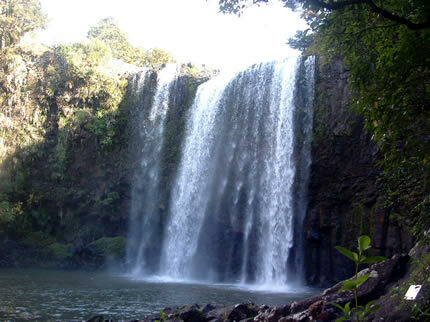 We saw so many beautiful waterfalls coming down the mountains. The fiords look amazing. I can see how James Cook didn’t venture out into the fiords, when you are going towards them, you would think there was no entrance to the fiords. 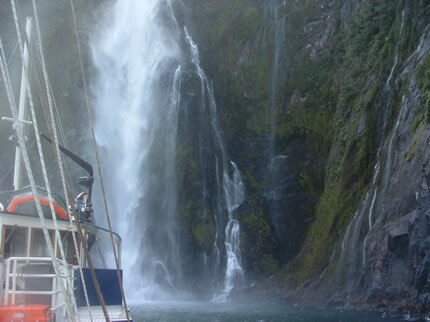 Here are a few photos of our cruise of the Milford Sound Fiords. We have so many photos from the cruise, which I will put up into our gallery asap. We really enjoyed the cruise and would definatley recommend the Real Journeys company. The staff were fantastic and gave us commentary on the way. On our drive back to Te-Anua we stopped off a few times and did a couple of short walks. There are so many walks to do, you could spend a couple of days there at least, doing walks around Fiordland National Park. We got back to Te-Anua at about 7pm. We decided we would drive on to Queenstown tonight. This was another 2 hours drive away. 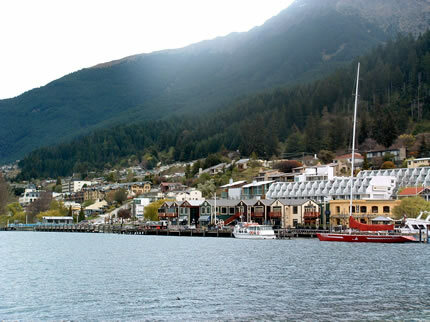 Queenstown is extremely built up around tourism. It is known as the adventure capital of New Zealand and is known all around the world, for being one of the first places to home the bungy jump. We parked our camper up near the waterfront, and took a walk around the town. Then we crashed for the night, as we were extremely tired. More blogs coming soon on our time on South Island, NZ. Just to keep you all up dated, we are now in Christchurch, staying in a hotel. We get a flight to Auckland tomorrow afternoon. We will spend a couple of days in Auckland and then we fly to Quito on 21st October. We spent 3 weeks touring around North island New Zealand and after having such a great time in our camper there, we decided we would go with the same company on the South Island (Spaceships), for 2 weeks. Having a camper really gives you the freedom to be flexible and wake up and decide where you want to go. We wouldn’t of seen half of the places without having our own vehicle. Plus it has been our accommodation for the last 5 weeks, so we saved a lot of money staying in the camper. We had heard that the South Island was even more beautiful than the North Island. We had seen so many beautiful places already on the North Island and didn’t see how this could be possible. Well after spending 2 weeks touring around the South Island I can stand by what the majority of people have told us about the South Island, it is by far the most beautiful part of the world we have seen so far. Each country has had something different that stood out to us, but New Zealand wins the top award for pure and natural beauty! There is so much contrast in scenery in New Zealand, high mountains, low plains, fiords, forests, glaciers, rivers, lakes, waterfalls, beaches ect. We were constantly wanting to stop to take pictures. There wasn’t 5 minutes that went by without seeing something that we wanted to stop and look at. I will write about the highlights from each day, but there is just so much to write about that you will have to wait to see us, to hear about everything in more detail. We slept in our camper every night this time, and showered in various public shower facilities we found along the way. When we asked at the I-Site they would tell us where there were shower facilities. Today we picked up our camper van at about 9am. 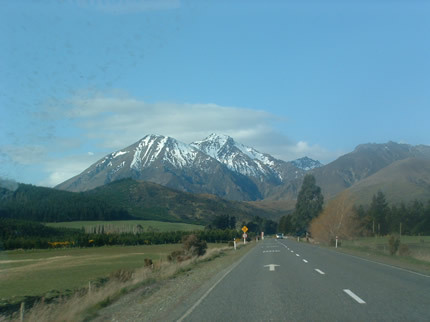 After going to the supermarket to get some food for the road we headed south from Christchurch to Timaru. As soon as we got on the road we were able to see snowy mountains all around us. We stopped briefly in Ashburton then continued onto Timaru (160km from Christchurch). 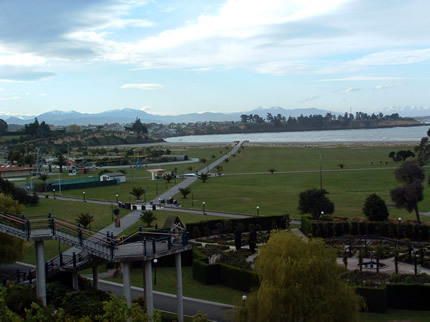 Timaru was a really scenic town, surrounded by snowy mountains. We decided we would stay here for the night, so we parked our camper up. We took a walk over to Caroline Bay Beach. There is a really nice park there with out door exercise equipment for the public to use and a massive park area for joggers. This morning we went to Caroline Bay to enjoy the scenery of the mountains and we also decided to play Frisbee for a while. I was trying to master my Frisbee skills, Paul was giving me lessons on how to throw in the right direction. I will have to keep practising. Paul also wanted to test out his model aeroplane that I’d bought him for his birthday. Then we set off to Oamaru (80km from Timaru). This town has a lot of Victorian and Edwardian heritage, which is easy to see when you visit, as they have kept a lot of the original buildings and all the new buildings keep in style with the rest. I really liked this town, it had so much character. There was a radio station called ‘Heritage Radio Station 88.3′. I went in to speak with the guy running the radio station. He showed me around. 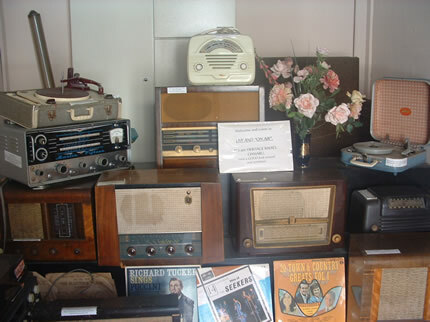 There wad loads of old radio and recording equipment that had been donated to the radio station. The radio station is run by volunteers. 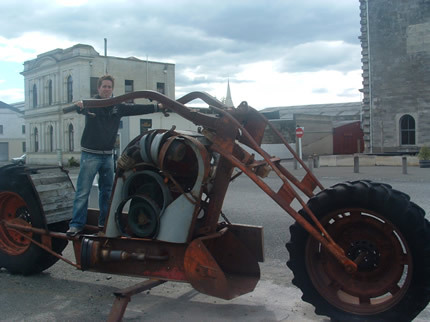 We spent about 1-2 hours looking around Oamaru, then we set off to Dunedin (120km South of Oamaru). We arrived in Dunedin at about 5pm. 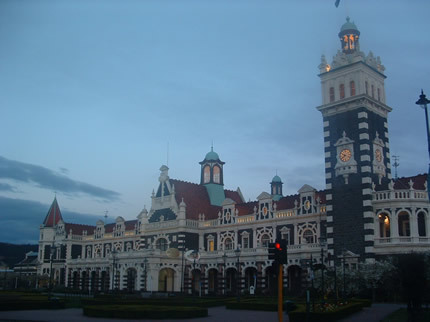 Dunedin is the second largest city in the South island. The word Dunedin is an old Gaelic word meaning Edinburgh. Like Oamaru, Dunedin has also preserved their Victorian and Edwardian heritage. This is also very clear in the style of their buildings around the whole city. Dunedin was one of our favourite city’s. Tonight we just took a quick walk around the city and then got an early night, ready to explore Dunedin in the morning. This morning we went to see New Zealand’s only Castle, Larnach Castle-although it wasn’t really a castle as such, just the closest thing they have to castle. 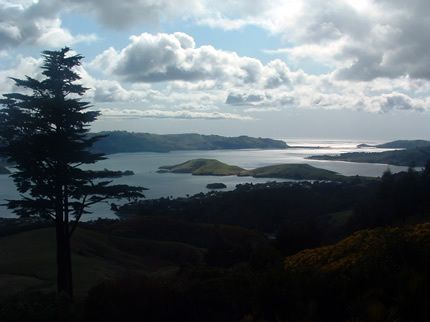 It is in a beautiful location, just outside of Dunedin and overlooking the Otago Peninsula. 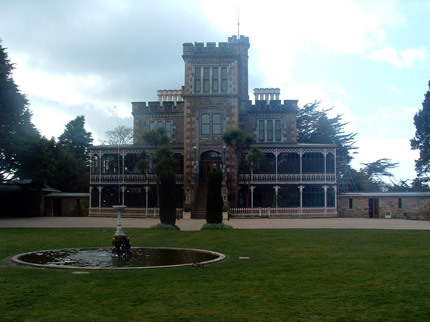 It was built in 1873 as the residence of William Larnach, who was a politician. The house was left to despair after William Larnach committed suicide, and it was later bought over by the Barker family in 1967. It is now open to the public. We just paid for entrance to see the castle from the outside and the gardens. This cost $12 each (£6). 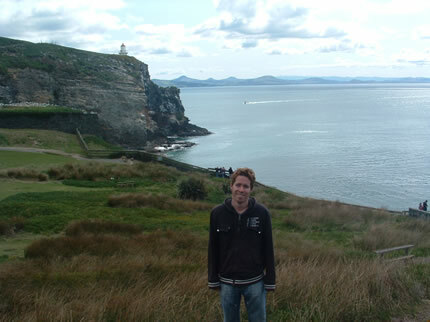 After looking around the gardens and enjoying the views, we drove on to Taiaroa Head, on the Otago Penisula. This is where the Royal Albatross center is and where you can view the Royal Albatross…unfortunatley we didn’t get to see one, but we went to centre anyway to learn about them. They fly from 500-1000 km a day and spend 80% of their time in the air. Their wing span is up to 3m. 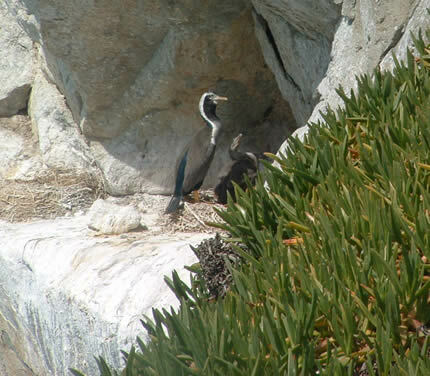 We did see the ‘Little Shag’ bird however. 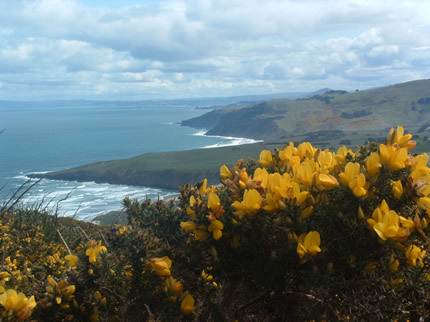 The view from Taiaroa is beautiful, just like everywhere in New Zealand. Next we drove on to Sanymount Road, where there are several short walks to beautiful view points. We walked up to a lookout of the Otago Peninsula. We then walked over to lovers leap, where there was an archway in a rock. We drove back to the city at about 4pm and spent the remainder of the day looking around Dunedin. The buildings are all victorain and Edwardian style. 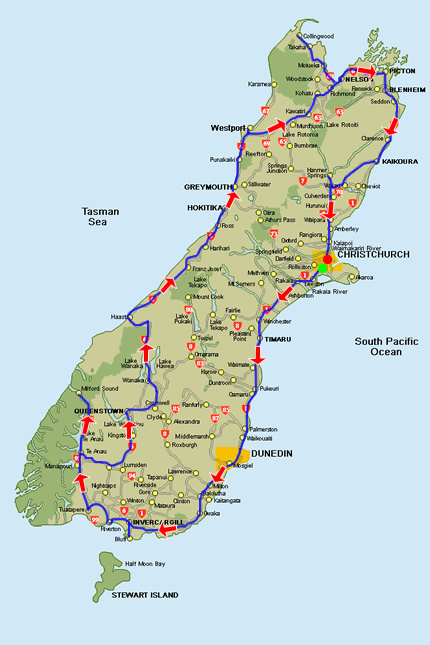 Today we set off towards Invercargill, on the tourist route, taking about 5 hours, with stops along the way. 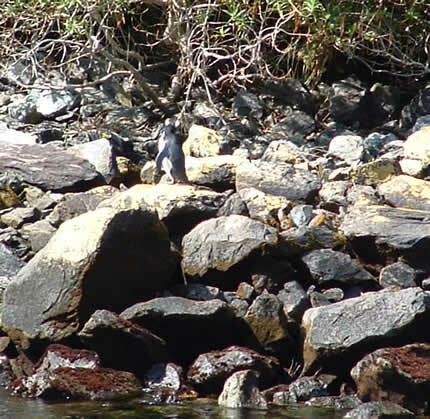 We drove to nugget point where you can see yellow-eye’s penguins at certain times of day. We looked and looked, but couldn’t see any. 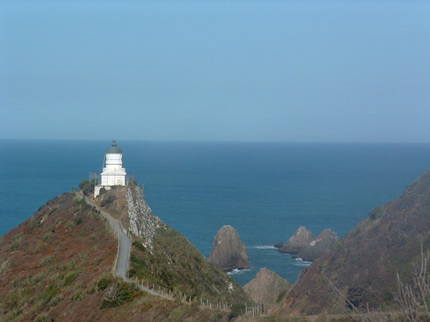 We then drove on to the lighthouse at nugget point. 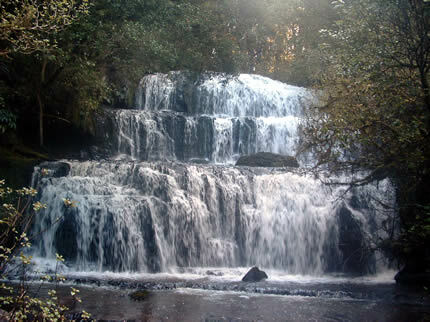 This is a cascading waterfall. Florence Point Lookout-where you can see the Bluff in the distance-South Islands most Southern town. 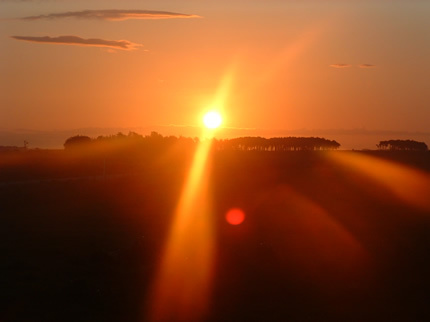 Lastly we watched a beautiful sunset over the plains about 30 minutes drive from Invercagill. We were on a road where there were no houses, just the sound of birds and all we could see was greenery and tree’s….such a beautiful site! We arrived in Invercargill at about 9pm. 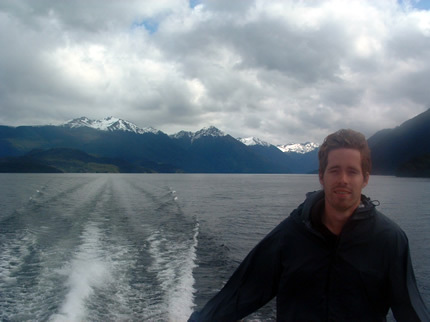 I will write about the rest of our time on the South Island as soon as possible. 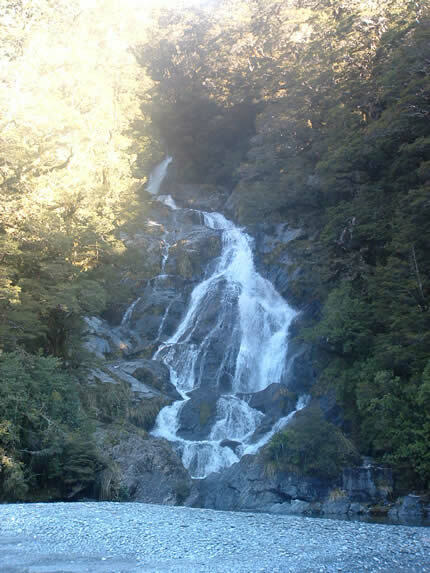 This morning we went to see Whangeri Falls, which were just a short drive from the centre, Then we drove to Whangeri heads and went to Ocean Beach. This was one of our favourite beaches with white sands, beautiful green hills behind us, sand dunes and trees everywhere. In the afternoon we drove to Abbey Caves. We walked down to the cave and took a look in, but there was a lot of water in the cave and we would of needed a torch to go inside fully. We also went to see one tree hill, Marsden point and an oil refinery. Then we drive through the town of Waipu, which is an old Scottish town. Then we drove to Waipu cove, a beautiful long sandy beach. We strayed in Whangeri for the night. 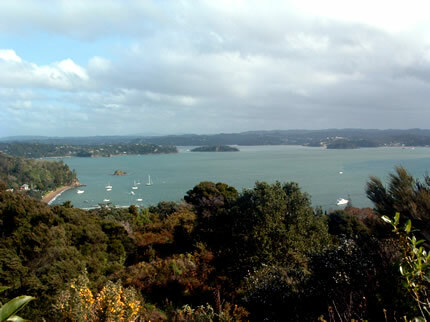 We left Whangeri early this morning, and took the twin coast discovery drive towards the Bay of Islands. 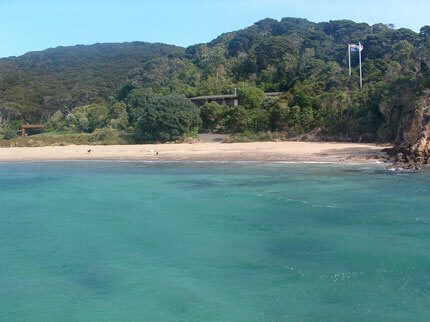 We stopped at a few beaches on our drive towards the Bay of islands. 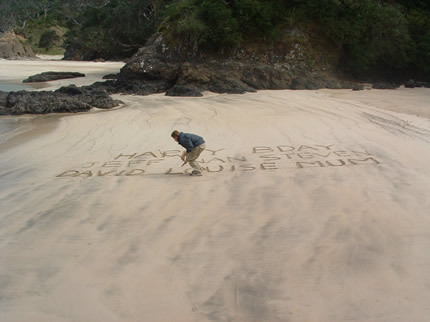 First of all at Whangeum Bay, which was a cove beach, then to Matapouri Bay, where we wrote the birthday message in the sand for, Jeff, Steven, Nan, David, Louise and my Mum. We also stopped at Whale Bay. We arrived in Russell (Bay of Islands) at about 4.30pm. Russell was the first capital of New Zealand, until 1841 when it became Auckland and then Wellington. We took a look around Russell, which is a small but lovely town. We walked up to view point in Russell, where we were able to see a fantastic few over the Islands. 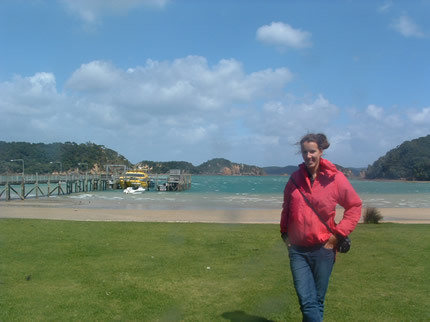 We decided to drive just across the bay from Russell to Paihia. This town was much more built up, with shops, café’s, hotels and a tourist information. We booked a cruise trip around the Bay of Islands for tomorrow with Explore NZ. We had a voucher for buy 1 get 1 free, so we got both tickets for $89 (£45). This was for a 4 hour cruise trip, taking us around the different Islands and also to see the Dolphins. We found a car park in Paihia that cost $12 for 24 hours to park up. Campervans are allowed to stay in the car park, so we decided to sleep there for the night. We woke up this morning at 7am in good time for our cruise trip, which started at 9am. It was raining when we first got on to the boat, but luckily it soon cleared up. I’m so glad we took the cruise as it’s a perfect way in a short time to see the Bay of Islands. The boat took us close by several of the islands. There are 144 islands in total but only a few have people living on them. We were shown around some of the islands that are privately owned by people. They have car takers who look after the islands for them, not a bad job!! 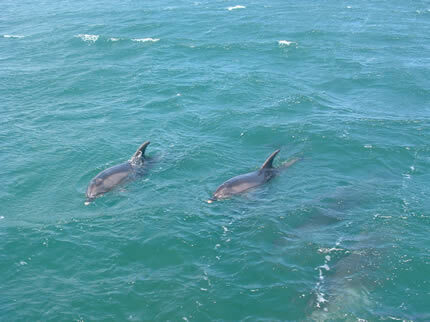 We got to see lot’s of Dolphins out today. We stopped at the biggest island, which was owned by a member of the cruise crew. It was passed down from the generations through his family and now it belongs to him. We stopped on the island for lunch. I would definitely recommend doing a tour with Explore NZ. It was a great way of seeing the islands and the staff make the whole trip very enjoyable, plus they know a lot about the islands and are there to answer any questions along the way. 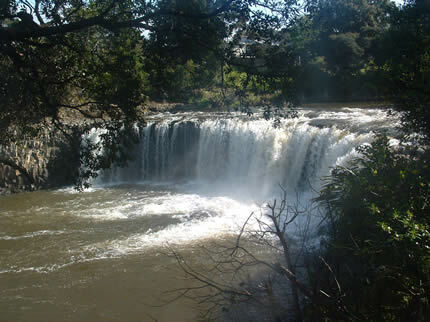 In the afternoon we visited Haruru Falls. Haruru means ‘Big Noise’ in Maori. 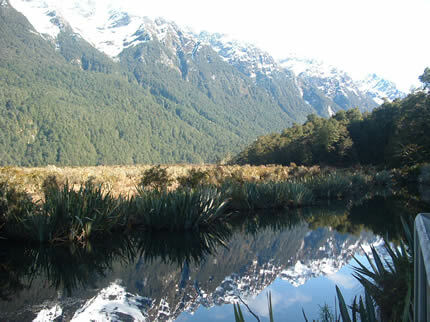 Maori legend states that a taniwka (water monster) lives in the lagoon below, so be careful! 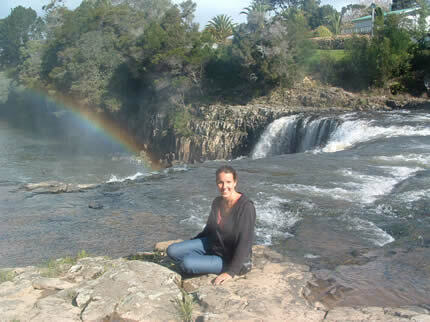 When we got to the falls there was a beautiful rainbow coming right over the waterfall. Next we went to the Golf course in Paihia. 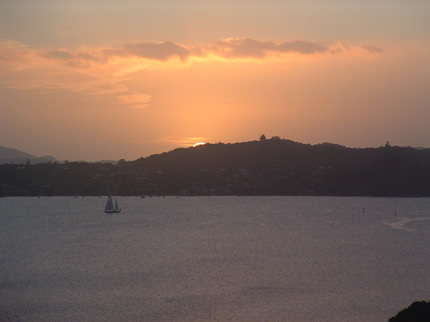 This is a great place to catch a sunrise as it’s up high and looks over the bay of islands. We went down to the rocks by the golf course as we had spotted dolphins in the sea in the distance. Unfortunately they had gone by the time we got back down. We slept in Paihia tonight. We woke up at 5am this morning, so that we could go and watch the sunrise up at the golf course. Luckily for us the sky was really clear, so we were able to catch an amazing sunrise. After sunrise we got showers in a near by town and set off towards Cape Reinga (Light House at the northern tip). We stopped off in a place called Manginangina, to go on a walk around a forest, where there were loads of Kauri trees. 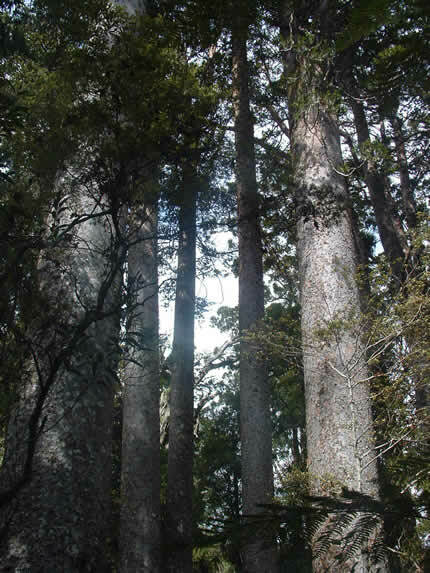 Kauri trees take over 600 years to grow and grow really straight. They used them for masts of ships, because of their strength and straightness. Unfortunately there are not many of them left. We also stopped in a small harbour town called Mangonui for ice cream. Then we stopped off in Kaitaia, before heading on to Cape Reinga. Paul had been reading this morning in a news paper about whales that had been washed up on the shore, because of the strong winds. 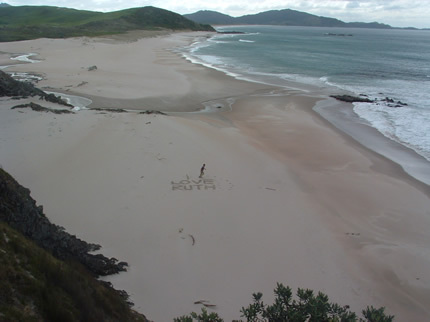 This happened on spirits bay, not far from Cape Reinga. We decided to stop off on our way. There were loads of volunteers there, helping to keep the whales in the water. 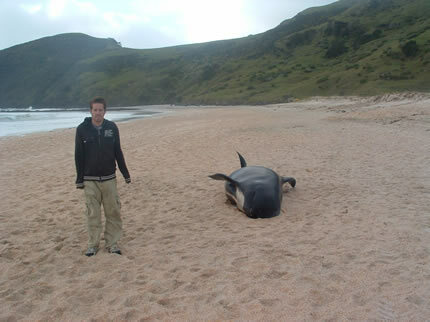 Over 40 whales had already died after being washed up onto the shore. They planned on trying to get the rest onto trucks and take them to another bay that was more sheltered. They managed to rescue about 10 of them. We finally got to Cape Reinga at about 5.30pm. It felt weird standing right at the tip of the country. We walked down to the light house and got some quick pictures before getting blown away. It was so windy. We went back to Kaitaia (about an hours drive back) to sleep there for the night. 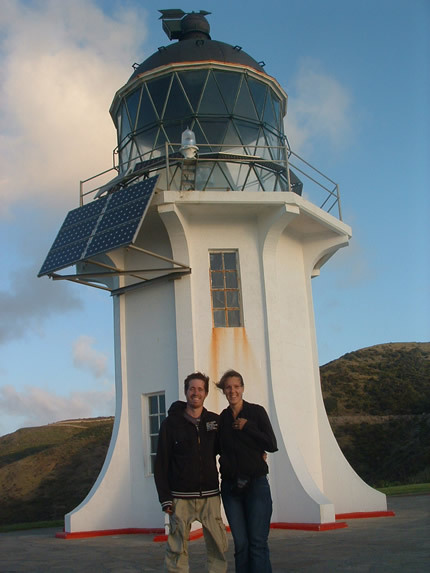 There is nothing but a light house at Cape Reinga, so we couldn’t stay there. Today we went to see 90 mile beach. We drove to the first entrance to 90 mile beach, where you are able to drive on, when the tide is out. We weren’t able to drive on the beach however, as our car hire doesn’t allow it. Many cars get wrecked on the 90 mile beach and stuck, which is not surprising. It made me laugh when we arrived at the beach and saw a sign giving the speed limit on the beach as 100km Hr. We certainly would not rate the beach as one of our top beaches. The water looked so unclean, this is probably from dirt and pollution because it is used as a road. Bus tours and cars come up the beach daily. We drove to another entrance of the beach, more north. This was a nicer part of the beach, however it was still very polluted. 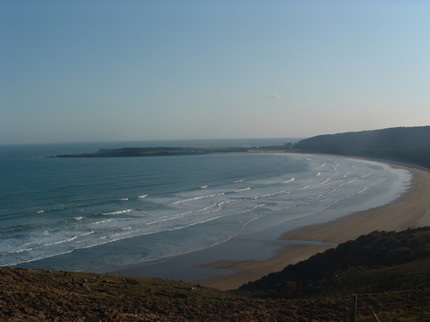 We parked the car up and took a walk up the beach and walked on the sand dunes which are all along the beach. After spending the morning on 90 mile beach, we continued driving on to Whangeri. We arrived in the evening at about 6pm. We stayed there for the night. Today was Paul’s birthday. We started the day off by going to Ocean Beach at Whangeri heads (where we had been before). On the way I hit a large bird called a Pukeko that was running across the road. I didn’t have time to stop. It was a horrible feeling hitting it. I had tried to swerve but the bird ran under the car and hit the back wheelsL We planned on watching the sunrise, but unfortunately it was so cast over, that we couldn’t even see the sun. We went to Paul’s favourite ‘Family Restaurant’ for breakfast….yes you’ve got it…McDonalds. He got pancakes and I got a toasted Bagel. Then we drove back to Auckland (2 hours drive). I asked Paul what he wanted to do for his birthday and he said go to the cinema, I didn’t think this meant going 3 times in 1 day, but that’s what we did. First of all I chose to see ‘Beauty and the Beast’ at the IMAX cinema. I think we were the only couple in the cinema without kids, oh well. It had an extra song in the film ‘Human again’, which is also in the stage musical version. Next we went to see ‘Wall Street’ then ‘The Sorcerer’s Apprentice’. We finished off the day with Domino’s Pizza. He would of loved a Kearnes sausage sandwich, but I couldn’t pull that one off. That will just have to wait till Christmas, when we are home in Ireland. Our camper was due back today. We checked into the City Travellers hotel before taking our spaceship back. Luckily everything was fine with our retuned camper, so no extra costs were added. We really enjoyed having the camper and don’t think we could of got around any better way! We stayed in Auckland until Tuesday 28th September, then we flew to Christchurch (South Island). We have been staying in a beautiful honey moon suite for the last few nights, here in Christchurch. We managed to get the room at a very good price, so couldn’t refuse. It will be hard leaving the room and going back to sleeping in a camper. Today we will be picking up another spaceship camper, to tour around the south island for 2 weeks. We will keep you updated as soon as possible about our time here on the South Island.